patterns in order to look at things in a different way’ – Edward de Bono. That is exactly how art spaces in Goa are merging different creative forms together at a single venue. Carpe Diem’s activities have ranged from art and craft classes for all ages to baking classes, gardening sessions, yoga and dance, book readings, film screenings, jewellery and flower making, Papier mache, cold ceramics, pottery, glazing, theatre, candle making, guitar classes and more. “Creativity knows no bounds, therefore art too doesn’t necessarily have boundaries. Whether it is documentation of a subject, or creating statements through various mediums, art cannot be contained and experimenting with a form for the first time is always a liberating experience for the individual,” says Daegal Godinho of Carpe Diem in Majorda. 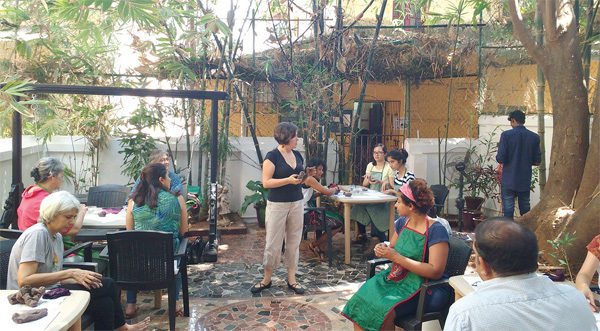 Literati Bookshop and Café in Calangute by Divya Kapur has transformed from a bookshop to a home for book launches, interactions with authors and film screenings. “The frequency of events at Literati depends on the availability of resource persons. We either approach an author or a publisher informs us of the writers who are visiting the state. For our weekly film screening, we focus on good films that you won’t get to see in a theatre. We have been conducting workshops and film screenings for the past four years and we have regular participants and many new members who are visiting the state,” explains Divya. Museum of Goa, Pilerne has reached out to experts in different fields from India and abroad to share their views at their venue. A comfortable art space, it has gone beyond art, exploring theatre, films, music, live performances and talks. Subodh Kerkar, the mastermind behind the museum, says, “The Museum of Goa is not to sell art but to educate in art. Contemporary art in India is growing and it is more than canvases with landscape and portrait paintings. If I take the names of the top ten contemporary artists in India, out of 135 crore Indians, only 1.2 lakhs will be able to identify them. One of them, Vasudev Gaitonde, had a painting of his sold for a whopping Rs 28 crores. These are international artists and yet very few know about them. Through the experiences and various programs at Museum of Goa, we want people to see their works and learn more,” says Subodh. “We also organise film and art appreciation classes to give a better understanding and appreciate these forms of art. The gallery is placed in such a way that the people who walk in feel inspired and even write down their names to know about the various workshops they can sign up for,” informs Miriam.